TriAD was contracted to conduct an ACM survey on a tract that included a two-story brick building. The building was proposed to be demolished due to its location within the Right of Way. TriAD began the ACM survey with a walk through and visual inspection of the structure. 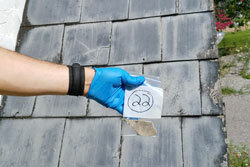 During the visual inspection TriAD personnel recorded the condition of the structure, sketched a site plan, and identified suspect ACM to be sampled. TriAD then collected suspect ACM in accordance with EPA regulation 40 CFR 61, Subpart M, National Emission Standards for Hazardous Air Pollutants (NESHAP). Following field activities, the samples were transferred under chain-of-custody procedures to a qualified commercial laboratory. TriAD evaluated the laboratory results and determined that ACM was present. Based on these findings, abatement of the ACM was required prior to demolition activities. TriAD prepared a comprehensive report including all findings and recommendations.